Earlier this month, an eclectic mix of hospitality professionals, academic scholars,and tech leaders descended upon Ithaca, New York for the 4th Cornell Hospitality Research Summit. It was a rare opportunity for industry and academia to come together and shape the blueprint of our industry for the next five to seven years. As OTA’s (online travel agencies) and short-term rentals like AirBnB capture an ever-growing share of market demand, hotels, airlines, and F&B groups must find creative ways to stay competitive. At the heart of this effort are innovations that enrich the sensory experience of guests, like Virtual Reality (VR) and Art Design. Helen Chun, an associate professor at Cornell’s School of Hotel Administration, shared an example of Lufthansa using VR headsets to upsell passengers to their Premium Economy cabin. By adding vividness and interactivity beyond the limit of traditional photography and videos, VR helps inspire mental involvement, or the notion that “I could envision myself visiting this place” in customers. Elizabeth Weiner, an art curator specializing in luxury hotels, spoke on how she incorporates research in choosing the right blend of art styles, colors, scale, uniqueness, and attention to detail to build a “sense of place” that fits each property. To capture the guest experience feedback, businesses have enlisted real-time engagement platforms like Local Measure to respond personally to guests as quickly as possible. 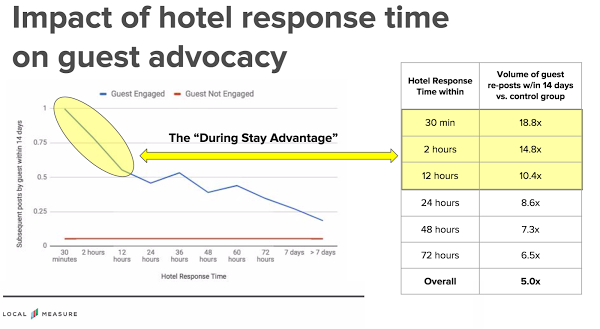 Local Measure’s COO, Sara Axelrod sparked a conversation by presenting a study that showed that hotels interacting with guests within 30 minutes of a social post generate up to 18x more brand advocacy. By combining rich sensory experiences with real-time service, businesses increase their ability to attract new customers. But how do you retain these customers? Enter Loyalty 2.0. 2. Traditional definitions of loyalty no longer apply in the age of the omni-channel guest. Typically, hotels have used nights stayed per year as a metric for guest loyalty, which in turn determines how much brands spend to retain these customers. New research suggests that Customer Lifetime Value or CLV, may be a more accurate indicator of loyalty. CLV predicts the net profit attributed to the entire future relationship with a customer combining both their own stays with referrals they make to other customers. The most interesting insight from this research is that OTA use did not necessarily have a negative impact on CLV, especially in the premium brands segment, where hotels are more likely to win over guests from OTA’s with their service. In addition, CLV also raises the question of whether guests should be rewarded for referrals, particularly in the age of social media where even non-influencers can drive significant traffic to a brand’s direct channels. While revenue managers and loyalty experts have turned to AI and complex algorithms to predict profitability, we’ve also seen a return to Hospitality 101 on the service side. A study by AETHOS Consulting Group appears to confirm the age-old belief that the highest performing front-line staff possess a “Hospitality X-Factor” that no technology can replace. With the ever increasing amount of data coming from both digital channels and face-to-face guest interactions, how can companies manage this data and make it actionable? 3. Integration is key for technology to remain relevant. A major theme that emerged from the conference is that much of the innovation in hospitality right now exists in silos. All this fragmentation has come at a cost, including significant delays for OTA reservations to be recorded in hotel POS systems, lack of recognition for loyalty program members, and “app fatigue” when guests are confronted with too many apps that are needed to maintain a seamless experience. With the average hotel tech stack now containing upwards of 20 systems, the biggest opportunities now lie in integrating the data that exists across POS, CRM, revenue management, and loyalty platforms. It is understandable for academics to doubt the rigor of claims made by hospitality professionals, and for hoteliers to question the practical applications of research in an unpredictable industry; but when both sides collaborate, we are able to collectively elevate the experience of travel. As conference co-chair Professor Chris Anderson stated, the biggest question for firms going forward is how to incentivize customers through technology to capture greater demand. By paying attention to innovations in guest experience, loyalty, and technology integration, you too can leverage the many “Opportunities in the Era of Disruption.” If you don’t, someone else will.